"For over a year now, our friends and relatives have been helping us live. 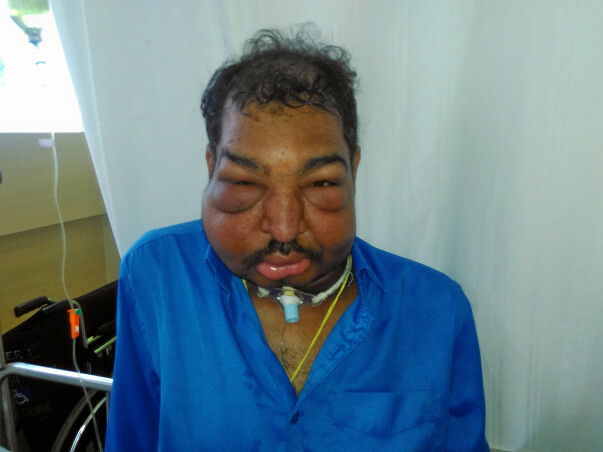 My father-in-law has been shuttling between Davengere and Bangalore finding ways to fund the treatment that is keeping his dear son alive." 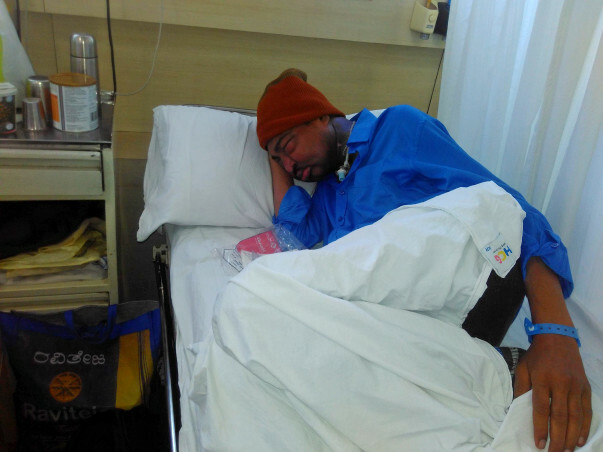 39-year-old Santosh was diagnosed with tongue and throat cancer early last year. Ever since he has engaged in the biggest struggle of his life against this deadly disease that has disrupted his world. 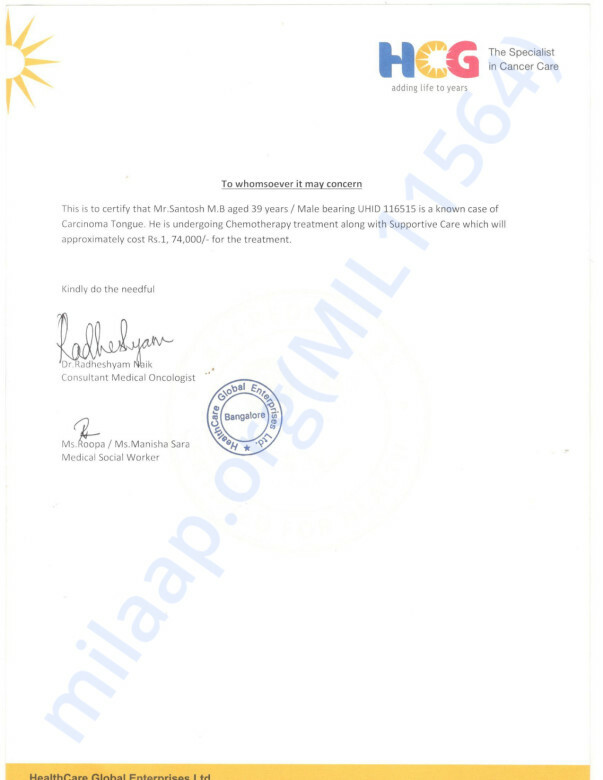 Santosh needs to undergo chemotherapy and cannot afford the treatment. "My father-in-law is a retired primary school teacher in a private school at Davengere and mother-in-law is a home-maker just like me. She is right now taking care of our daughter while we are here in Bangalore for Santosh's treatment." Santosh thought he had mouth ulcers or sores. He kept going to the clinic but no medicine gave him relief. The frustration from living with this affliction got to him, and he decided to get a second opinion. Santosh visited Manipal hospital. Examination and tests revealed that he had tongue cancer. It has been a rocky road for this family ever since they received the horrendous diagnosis. 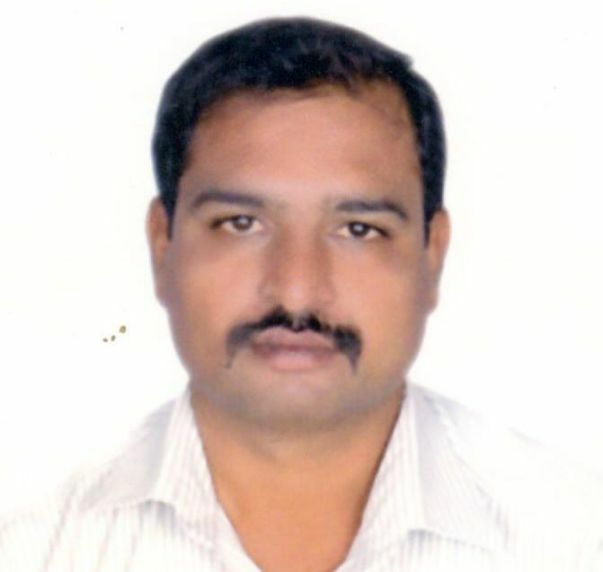 Santosh is the first born of the family and used to work in a private company with no. E.S.I benefits. His brothers are all married and have nuclear families. He supported his parents, wife and child. Now he had to quit work to take care of his health. Left alone with no source of income, Santosh struggled to pay his medical bills. He had to undergo 9 cycles of chemotherapy, surgery, and follow-up treatment. "We have spent over Rs. 15 lakhs. My father-in-law liquidated his savings. We have borrowed so much from everyone we know. Santosh's savings are also gone. And now we need more." Right now, he needs chemotherapy and supportive care. 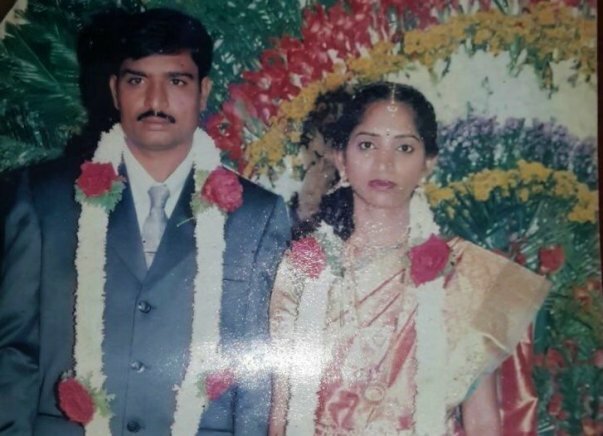 Santosh and his wife are living in Bangalore until doctors say it is safe to go home to his daughter. They are in great emotional turmoil in addition to the difficult financial situation. Your support would mean a lot to the family especially in this difficult time. We just received some sad news from the hospital. Unfortunately Santosh passed away on the 18th of March. He was scheduled for a chemotherapy on the 7th of April, however as his blood level had decreased drastically, he needed an immediate blood transfusion. He got discharged and went back home the next day. After a few days his tracheotomy ruptured and he collapsed. Immediately he was taken to a hospital nearby, however he could not survive. Thank you so much for coming forward to help him, let's pray for the family through these tough times.